Versions of ECC83. Sure not all versions. NOTE: Many of the special versions has their part number abused. So don't look for ECC803S and expect always the same. The only part number which is always the same is ECC83. With all specials, the PART NUMBER SHOULD BE RELATED TO THE BRAND, and then you make no mistakes. However if you want "ECC803S" and do not look at the brand, you can get something inferior. 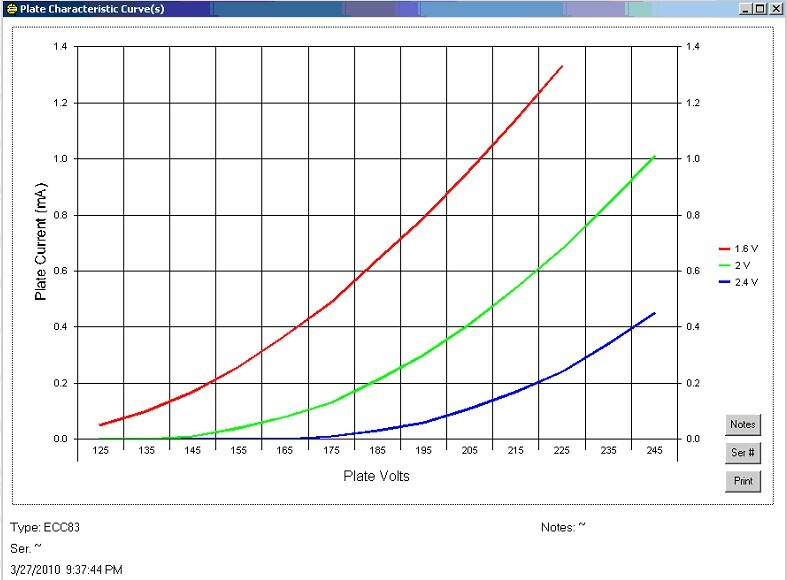 The most crazy example is, the TESLA E83CC = TFK ECC803S, but TESLA ECC803S = Philips ECC83 long plate. However with ECC83 part numbers, the efforts to "impress" you with nice part numbers are very many. Yet some extremely beautiful tubes van be found if you look carefully. Like Valvo-E283CC, or TESLA-E83CC. Version of ECC83 with electrical shield. It has different pin connections a ECC83, and works only on 6.3V. For the rest it is equivalent. 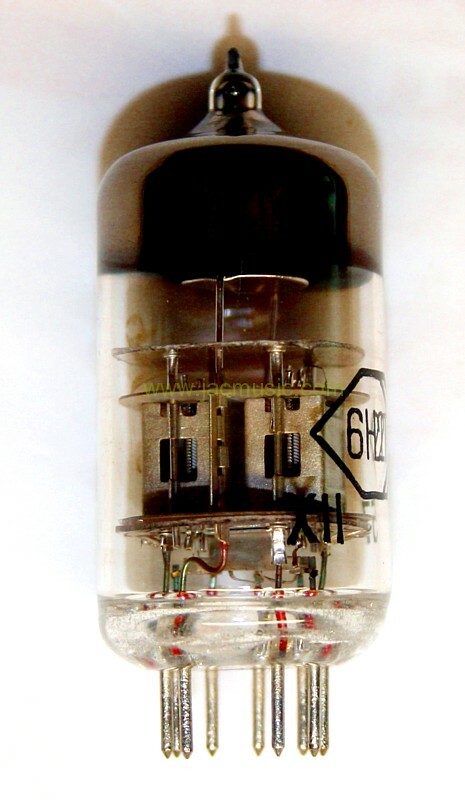 This tube must be seen as 2x 12AX7 in parallel. So take two 12AX7 tubes, parallel them pin by pin, and there you have your 12BZ7. That describes it best. Picture here. Low microphonics version, Westinghouse or some others. 6L13 seen in East Europe. A= Can be used for circuits that have all filaments serialized. So it has tighter selection on the filament current, and will digest a switch-on surge like in TV's when they light up brightly from the inside when you switch them on. The one and only ECC83 reference on the planet. Absolutely unreplaceable product. The building technology is lost. The letter "S" has been tried to explain as "Selektiert" by some. This shows best the complete misunderstanding of the Telefunken "S" series. The quality results not from selecting at all, but results from things like Frame Grid (VERY few companies ever were able to build a frame grid with 100x gain). It results from the fabulous cathodes, their extreme low noise, minimum 10k hours life time, and specifications in the data sheet for anything at all. Well before quoting the 10 page data sheet, you should read it from 4tubes.com, and compare it against any other so called"better" ECC83 whatever the vendor. Reading the data sheet is the only way. Opinions about "sound" is one thing, but about electrical data we don't need opinions. Instead you better read the original fact sheet, also called data sheet. What makes the ECC803S to much "S" is on the first page in compressed form, and what follows them is a load of tables and diagrams. Such a data sheet by itself is a reference. Amazingly, any NOS tube still meets all that data after 50 years. This is the real quality. How little understanding there is about this, can be seen amongst today's tube manufacturers who sell ECC803S which is NOT an ECC803S, but an ECC83 with another stamp on it. For instance the Tung-Sol Versions by New Sensor is a tube like that. The markets need a lower cost ECC803S, so there you are. They don't even bother to balance the tubes for you, thought this is elementary for ECC803S. For me this is legal faking. Also their guarantee is only 3 months whereas TFK ECC803S was specified for one year continuous use (10.000 hours) minimum in the historical data sheet. Another strange example is the JJ made ECC803S, which does not meet the Telefunken data sheet in the most elementary details, where it comes down to being a REAL ECC803S : 15% balance guaranteed still after 10.000 hours. Well JJ do not write so in the data sheet, unlike Telefunken, so they are not specifying a REAL ECC803S, but then they should not "borrow" the part number, and honestly give their tube another name, and by this making clear to you that their tube has not the same good data as the original data sheet of Telefunken. Comparing those data sheets unveils the truth quickly. So to my opinion, REAL ECC803S is definitely not made any more. If you can afford it, use TFK ECC803S TFK and TESLA E83CC. All others are imitations. Something " in-between" is the early JJ made ECC803S, which they produced with a TESLA brand licence in their early years. So these are dangerous, as you may think they are TESLA made, but they are in fact JJ made, and only TESLA branded. This was fully legal by the agreement they had with TESLA. I was at TESLA myself, and the director explained me this story. As long as you are aware, it is ok. To me it is unclear if those JJ had the original ECC803S specs, or the later (not so tight) JJ specs. For your safety I recommend you real old, TESLA made ECC803 made by TESLA and not made by JJ. Though these are difficult to keep apart, the optics of the JJ made is kind of typical, for instance the not so well printed logo, and less details printed on the tube. (please don't send me Ebay auction links about this - thank you). * Please don't copy this text on another website, or on ebay. Or anything else from this website. If TESLA: Special designation for their FRAME GRID Version. Secret tip! Only 10% of the TFK price is payed on the market. Don't know why that is. Anyway, if you can get E83CC TESLA, and you can afford them... then this is the tube. If VALVO: Holy grail tube. Very tight tolerance, with all additional specialties of TFK ECC803S, except Valvo is a no frame grid, but for that has triple mica. This tube is balanced per data sheet Plate current +/-12% only, at FIXED grid voltage. This is more than excellent, it ensures perfect bias in any auto bias circuit. Almost the same as ECC83. 5751 is lower noise, and slightly lower gain. Will replace ECC83 in most audio applications. From RCA handbook: "For High Fidelity Audio applications critical to low noise and hum" Best ECC83 you can get. Unfortunately extremely rare. Only thing better is TFK ECC803S and historical (not JJ) TESLA E83CC. Also this tube is subject to what I call part number faking, by new made "so called" 7025 that are none. Not pin compatible ECC83, because it has no center tap on the heater. So only for 12.6 Volt products. JAN="Joint Army Navy". This is an 5751 with lot testing testing done. Typical Studio version of ECC83. Secret tip, even TFK can be found NOS. It has a different pin connection. One pin is used for shield. Plate power only 2*0.5Watt. Standard ECC83, but English military P/N. These were made only by Mullard. Ultimate ECC83 when they have boxed "Mullard" plates. Most excellent Russian version of ECC83, but different pin connection. NOS Supply: Virtually Zero. 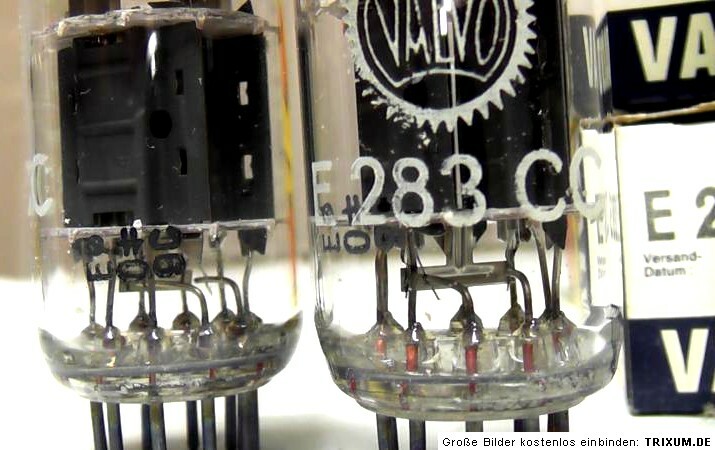 ECC83 NOS is one of the most sought after tubes. In the +20 years we are in this business, we only had two times the possibility to buy NOS in quantities. For the rest, you have to pick these up one by one. The price trend is accelerating for this tube, since demand stays high for phono stages, and supply has always been low. So we believe NOS prices for good USA or EU brands will soar well over 100...150 Euro in the next years. (We write this in 2013). With any "high price" predictions, this usually comes true for the BEST versions, BEST brands, etc. You can recognize those, as they are already expensive now. Probably the types that are still cheap, will stay in that range, but special attention you should have for undiscovered types, and such types that have apparently"good supply" but that is only one company that happens to have 1000 pcs or so, and you see many Ebay sellers, all buy from this source. After the source is dry, prices will suddenly soar. Also read here, and scroll to the Lemming Effect. Special attention needed: This tube exist as normal grid tube and as frame grid tube. The frame grids have generally better parameter stability, lower noise and lower hum. These are the later technology, and also a technology only very few could make. Frame grid wires can be as thin as 10um, which is technologically speaking a masterpiece of fine mechanics. The frame grid wire is so thin, when you open up a defective tube, you can not see it with the bare eye. To give you an idea, the size of a large bacteria is 5um. When frame grid tubes, we write it in the description. Attention: This is an export Price List, valid for companies in the European Community with a VAT Identification number, and for companies or private persons outside the European Community. Inside Europe, please ask for a quote, including VAT tax. 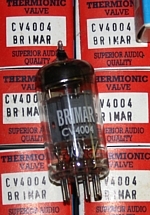 Original box , clean, pristine tubes. Very high Quality version of ECC83, but pin connections the same as ECC88. So not pin compatible. Original boxed. Date codes from 1957. Secret Tip Audio tube. Note the double mica in the top! This is done to keep getter flash traces away from the tube (first) mica. Besides it gives higher mechanical stability, this construction has the extra support rods, same as with the some USA very high qualify tubes. Click on picture for a large view. 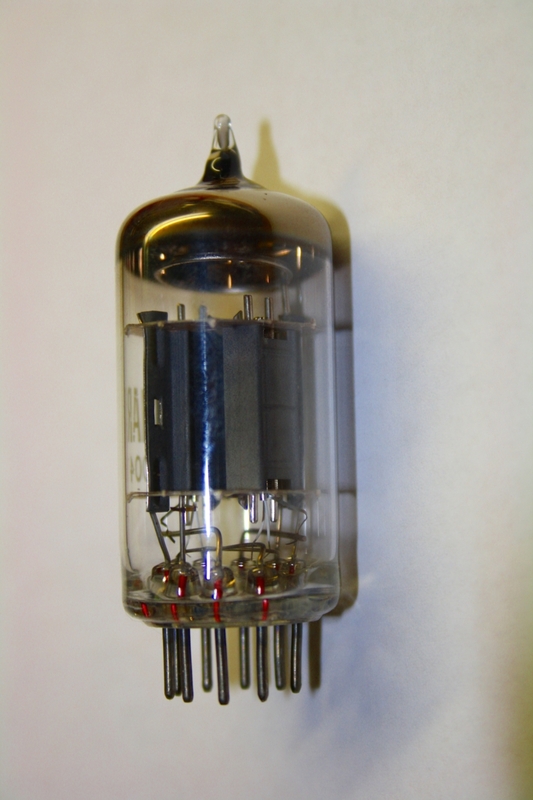 This is only found with extremely high quality tubes, such as Telefunken ECC801S, RCA 5691, 5692 and some others. Do not be mislead by low prices for this tube, there is simply more NOS supply as demand. The crowds can not use it, it fits in no standard amplifier. This is actually the in the top 10 best ECC83 you can buy. However be aware, it does not directly fit into standard amplifiers, since filament connections are another, and only 6.3V connection is possible. 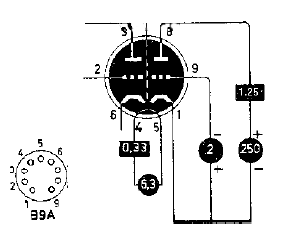 So...... if you plan to build your OWN amplifier, you should consider to use 6N2P instead. This is one of the finest ECC83, from the United Kingdom. It has a boxed anode, and what some collectors call"old coin base". The anode has some similarity with M8137, also boxed, but this is not M8137. They are marked CV4004 which is the military grade version of ECC83, used by the UK army. Matched pairs possible. Though we have a small stock, these are actually very rare as NOS. Click here for a large picture. E283CC is a very special version of E83CC. Specified similar like the famous Telefunken ECC803S. Special Cathode Layers. Same as ECC803S has. This is a factory balanced tube, can be used for phase splitter. Also featuring an electrical shield. You don't have to use the shield, but you can. It has different pin connections as ECC83, and it works only on 6.3V. For the rest it is equivalent to TFK ECC83 :) A perfect alternative to TFK ECC83. These tubes were only made bulk packed. These ECC83 are 1968 production. These are 40 year old, and all test like new right out of the box. They have beautiful getter quality, and perfect appearance. Will be send with Funke W19 test data on the tube boxes. Very nice TESLA tubes, with the yellow printing. Test data is included. Original red box. I think it is a Philips tube. Tube factory is closed now. These are NOS. Funke W19 Tested, data is with the tubes. These tubes have Philips construction. Very nice green printing. Original box. Mint quality items. 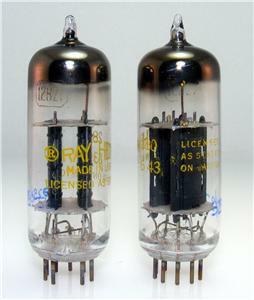 Tubes in mint condition. 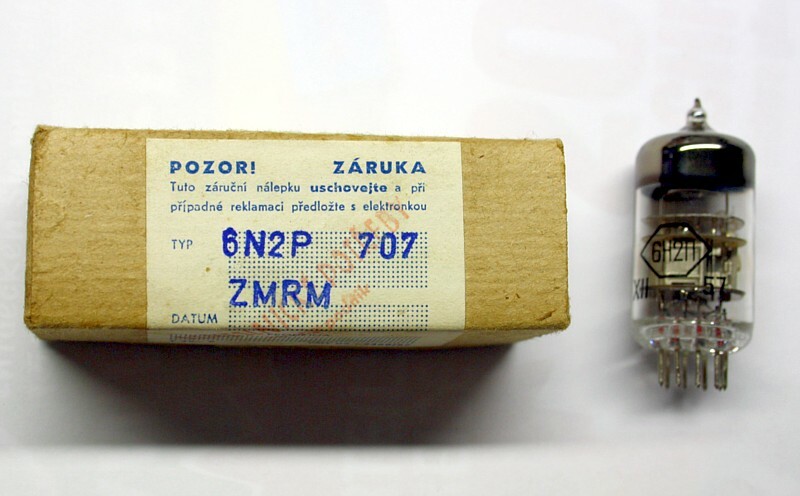 Original blue yellow boxes, with control number (309,410) which is printed on the tube and on the box. They have fully identical constructions inside, and long ribbed plates. Check here. 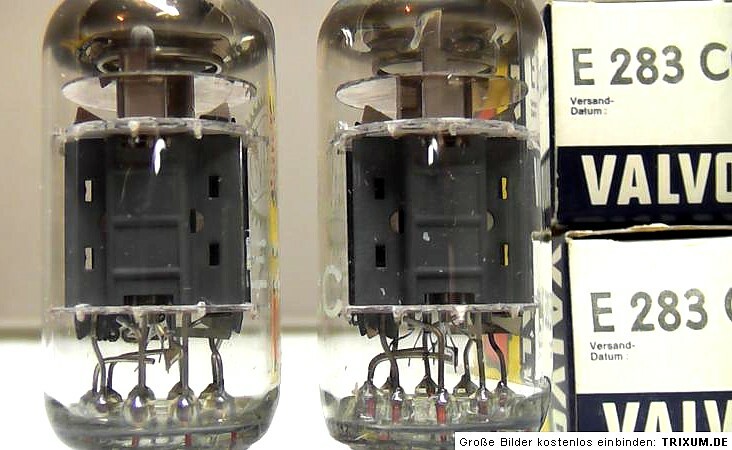 Tubes in mint condition. Original blue yellow boxes, with control number 204. Same looks as above tubes, but printed ITT LORENZ. Original, military box, with many information printed on it, like date code., lot number, etc. 1993 date code. DOUBLE MICA. Original orange boxes. Test very strong. Smooth plates. Little use. Nice appearance, strong data. Test report included. These two are the only NOS FRAME GRID "ECC83" types. New Old Stock is only available from TESLA. Theoretical also from Telefunken, but TFK ECC803S is not for sale anywhere. 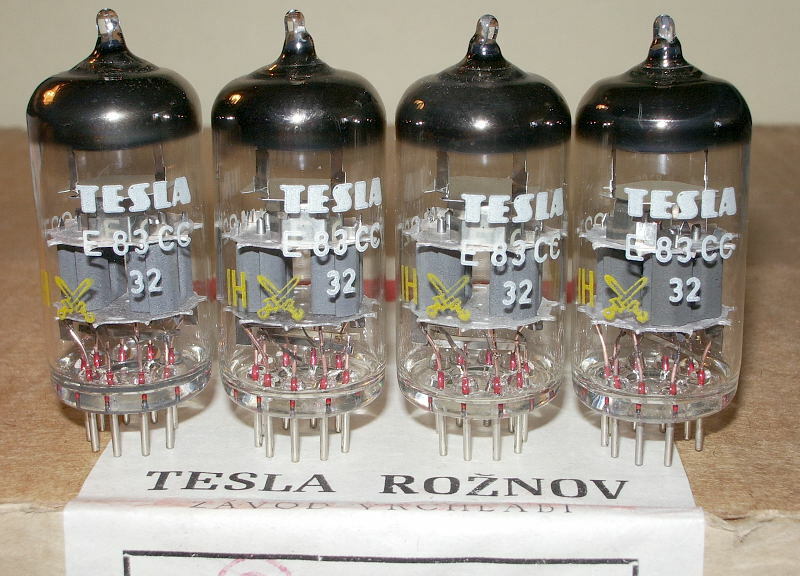 TESLA E83CC is identical to Telefunken ECC803S, with only difference, the TESLA has no gold pins. For the rest these are IDENTICAL. I think this is the best "ECC83" you can buy on this planet! 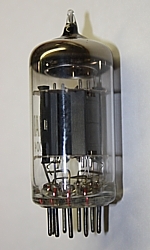 This tube is made by TESLA, on the original Telefunken machines, when they were still new, and materials and chemicals were identical at that time. We sell the pairs balanced and matched, which is easy to do, as they all test the same anyway. This is pure quality! If a pair has fully identical data for each tube, it happens. Send as balanced + matched pairs. These have PRAGUE factory code "32" on them, plus date code, plus the sought after "Yellow Sword" for extra quality. Please note, we have those here in original factory 100pcs bulk packs, that we were the first to open!!! We ship them in new boxes. AS LONG AS STOCK LASTS. This will be going to an end. It was a unique buying opportunity, we do not get those any more. Compare it with Telefunken ECC803S here(1) and here(2). You can see, internal construction is identical. Click here for a movie about first time opening those boxes. This is the dream of all NOS tube buyers. No! These are NOT made by Telefunken West Germany. These are NOS USA made, 12AX7WA, which cost normally 85 Euro also. Just for you interest. These were in a large supply of NOS tubes, I bought from somebody who went out of business, and I bought the whole lot at a fixed price. And then, at unpacking, I found these 8 fakes in the lot. Nicely re boxed in original (!) Telefunken boxes. So the only thing that is original is the box. As you see, it happens to me also. I was pointed out by somebody, they also appeared on an auction website already for 750 Euro each. Sorry, but this is NOT me! Branding and boxing is done very well. So yes there fakes, but I am telling you so here. At least they test very nice and they are NOS tubes. Price is 85 Euro one. Test values for both Gm and plate current are excellent, and I put that on the boxes with a removable sticker. Test data is actually perfect. 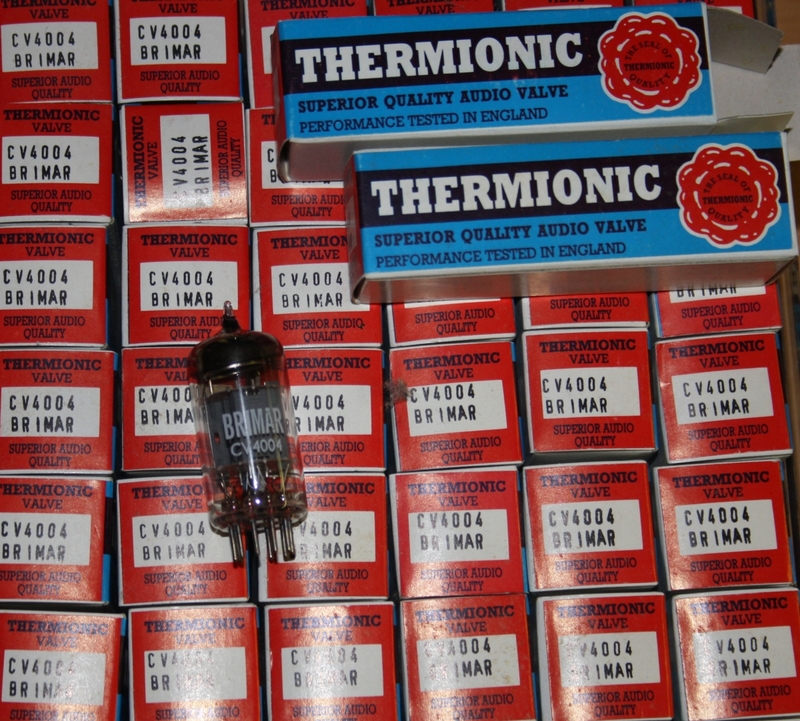 So the price is just the normal price for good USA NOS 12AX7. There is a code on them: 72058. This is the holy grail of the ECC83 tubes. Please look at the test reports, and see the incredible quality of this pair. These test exactly at the data sheet values (so called bogey tube). This is very rare they are so exactly identical. They are a balanced matched pair. Logo printing and pins is like new, never touched before other than for testing them. Same date code, from ULM factory, original boxes and of course diamond bottom. The pictures are the original from the tubes for sale here. Sorry, this pair is sold. These are Amplitrex tested, and data written on a removable sticker. The small print factory information as pictures is for one of them. They all have the triangle sign in that etch code. Please no guarantee for detail hunters for shape of whatever piece parts, or etch code. Pictures are for just one of them, but they look all the same to me. Market prices of those are rising sharply at the moment. The ultimate Valvo tube, only topped by the red series. (This is the white series). These are Amplitrex tested, and data written on a removable sticker. Perfect quality tubes, made in Germany. Printing is a little bit fainted. Very good boxes. ECC808 is comparable to ECC83, but with extra shield connection, and 6Volt heater only, and very low power (0.5Watt dissipation only). 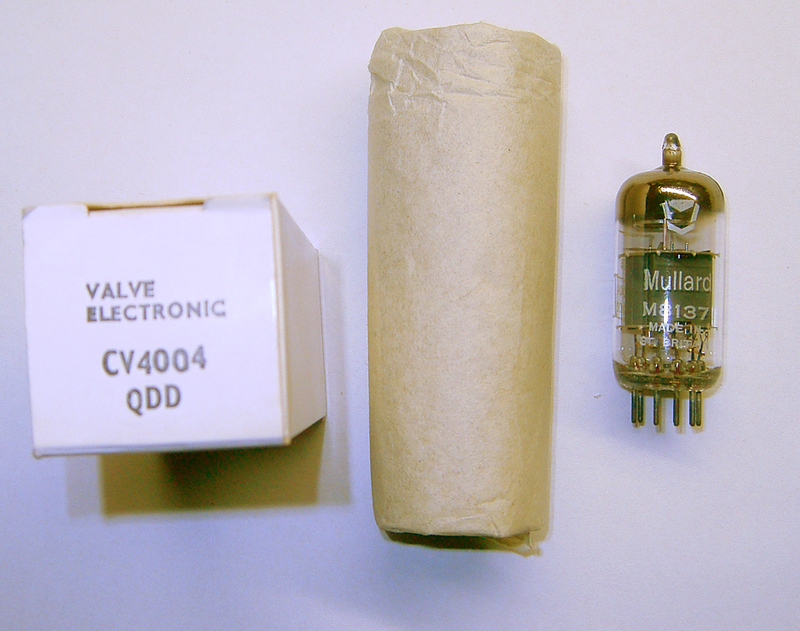 Obviously a very small signal tube, and so it is low noise. Often found in pre amp stages of Studio equipment of the 1960's. One of the fines British ECC83 ever made. Clean, pristine tubes. Front - Box. Made in Great Britain. On the tubes it has the small printing 641 R7J5 for who knows what it means. Original box. Very clever damper construction with separate mica part, which is on the cathode top, for lower microphonics. 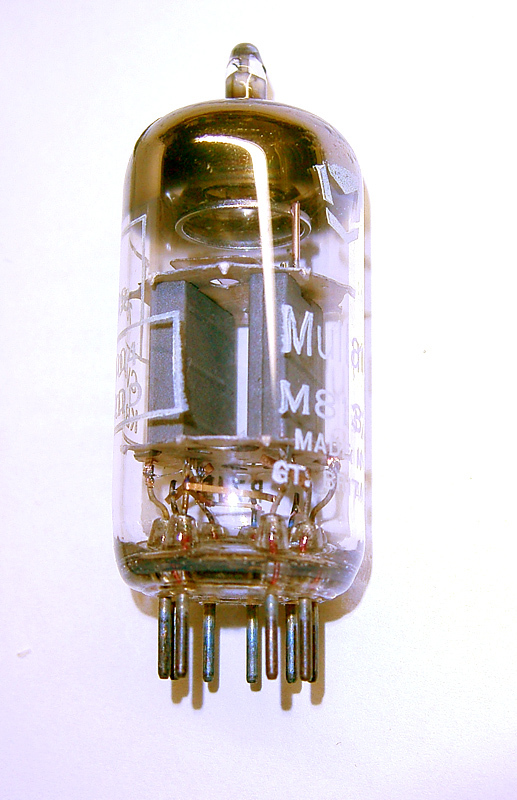 AMPLITREX tube curves included. Note, this is the very rare BOXED plate version made in UK, not the ribbed plate version as can be found still. Sorry for the price, but I never find those again NOS in their own boxes. Please note, I have only one pair left. THESE ARE MARKED CV4004. So boxed anode, and identical construction, from the same lot. Original Military Mullard Box. Small print on the tubes 641 R3K3 and 641 R1I2.